Forums » General Discussion » Home Theater » How can I elevate QS-8's without wall mounting? #398567 - 11/15/13 12:25 AM How can I elevate QS-8's without wall mounting? Anyone figure out a way to have QS-8 speakers without having them wall or ceiling mounted? I hope to move into a new home shortly and will lose a dedicated home theater room. The great room will have to do and I don't want speakers mounted on the wall. Is there a stand that I can mount the bracket to that will allow me to place the speaker/stand on a table? Hopefully someone has addressed this but maybe I am the first. 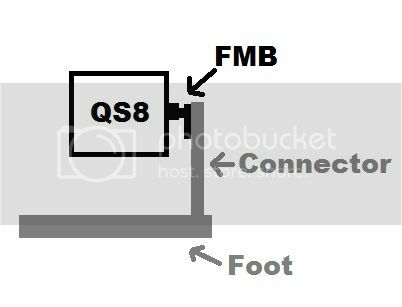 If you click on accessories on the QS8s you'll see the FMS QS stand pair. It has a custom plate that lets the woofer play freely. Greg, Axiom offers the FMS-QS stands for that purpose. As to placing them on a table, this is feasible, but provision would have to be made to raise them at least a few inches so that the bottom woofer is unobstructed. In the past one of our members raised his up on soup cans. I looked right passed the accessories. Don't know how I did that. You could *probably* DIY something if you wanted them to sit on end tables. For each, you would need a Full Metal Bracket, a metal/wood "foot" that has some weight to it plus is bigger (would need to extend further in front of the front face of the QS speaker), and a piece of metal/wood to connect and elevate the speaker a few inches above the "foot." It would still run you about $60-$75 each to make. Maybe Axiom should make an option like this. They could build it with some type of adjustable (using pins and not friction locking) connector piece for different heights. Or just offer the stands, but with shorter lengths. Sure, you can cut the "pipes", but why pay for the extra if you don't want/need it. They could then sell the "pipes" separately too for the different heights. Nice drawing, Nick. I'm a visual learner. You wouldn't even require the FMB to implement that sort of design, though. You could just have a wide-ish, solid piece for your "connector" (instead of a "wall") and use the included wall mount. Like what Tom and Nick are alluding to...it would be like a coat/hat stand with the Q's mounted near the top. I've thought about this in the past actually. Just make sure it's got plenty of stability in the base so it's not "tippy". I like DIY stuff but unless I can just buy parts that I need, I tend to buy a complete item. I don't have a lot of word working tools but that may change. I can't find a tv stand with a large enough area to keep the VP-150 channel. So I may have to build a wooden box type of structure that is open on the front and back and has about a ten inch height that can hold the VP-150. I would then set the tv on top of this box type structure with the box type structure resting on whatever tv/media stand I buy. Chunky soup was preferred over Campbells for better bass response! Hockey Pucks are the official kludge on this topic.